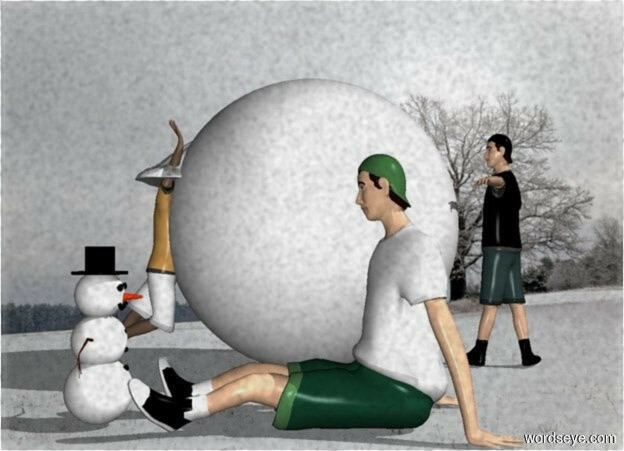 Input text: a gigantic snowball.a 1st boy is -6 inches right of the snowball.he is facing the snowball.a 2nd boy is left of the snowball.he is facing the snowball. [snow]backdrop.shadow plane.a 3rd boy is 3 inches behind the snowball.he is facing right.a small wave is -14 inches above the 1st boy.the wave is snow.the wave is -12 inches left of the 1st boy.a small snowman is right of the 3rd boy.it is facing the 3rd boy. Funny :-) And the mottled effect is great for snow.